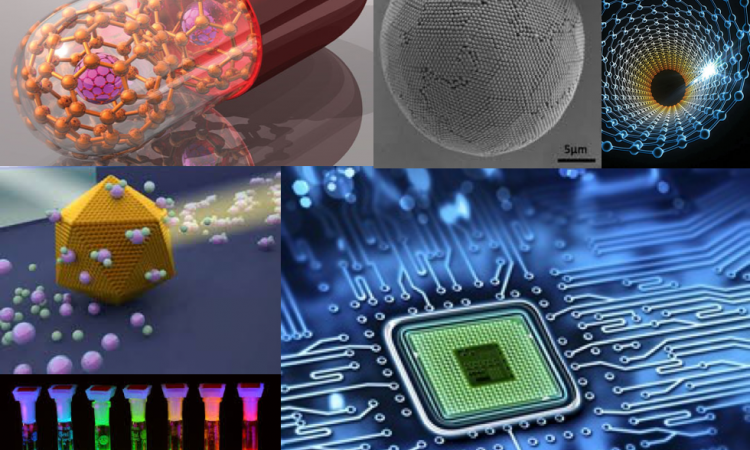 Nanomaterials have unique optical, mechanical and electronic properties which have revolutionized several fields like catalysis, medicine, integrated electronics, sensing and robotics. 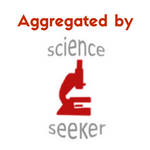 Ever since their discovery, their applications are multiplying every single day. This versatility and uniqueness of nanomaterials has led researchers to explore the reason behind their performance. The article discussed here addresses this mystery of nanomaterials by deciphering the fundamental questions like why are nanomaterials different? What gives rise to their unique properties? What makes them different from the bulk material? If we start thinking of the possible reasons, the first obvious reason that comes to our mind is that the nanomaterials (10-9 m) are much smaller than bulk materials. Is the small size of nanomaterials responsible for their properties? As it turns out, yes! Researchers have found that there are two size-dependent effects that govern the behavior of nanomaterials, one is surface effect and the other is quantum size effect. 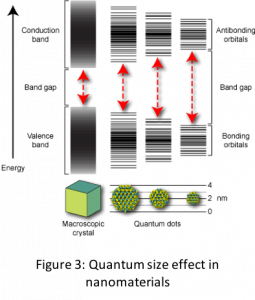 Surface effect is caused due to increased surface to volume ratio in nanomaterials (see Fig. 1) which makes surface a dominant factor in dictating properties. In general, in both bulk and nanomaterials, the atoms on the surface are different from the atoms inside due to unsatisfied bonds (see Fig. 2). 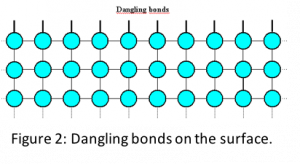 These unsatisfied bonds, also popularly known as dangling bonds, make surfaces more reactive and less stable. In case of bulk material, since the surface area to volume ratio is small, surface contribution or influence on the properties is minimal. However, in nanomaterials, the increased surface area to volume ratio magnifies the effect of surface atoms. From previous studies on systems such as magnesium clusters, sulphur rings, confined indium and platinum nanoparticles, the surface effect has seen to manifest in faster chemical reactions, lower melting points, coexisting phases and negative heat capacities. These have enabled application of nanomaterials in catalysis and sensing. The other size dependent effect that is responsible for novel properties of nanomaterials is the quantum size effect. This effect changes the density of states or band structure in the nanomaterial transforming insulators to semiconductors, or non-metals to metals or even non-magnetic systems to magnetic.Quantum size effect can be understood as physical confinement of electrons in nanoparticles due to their small size which causes the energy states to become discrete. One can imagine this confinement akin to ‘particle in a box’ problem in quantum mechanics. Thus, both the position of energy states and distribution of electrons in the energy states changes (see Fig. 3) leading to effects such as increased band gap in semiconductors, ferromagnetic behavior and surface plasmons in metals. Properties influenced by quantum size effect show a discontinuous behavior due to discontinuous nature of filling of electrons in energy levels. Long before a detailed investigation of this effect was performed, metallic nanoparticles were used in stained glass windows of cathedral and palaces. 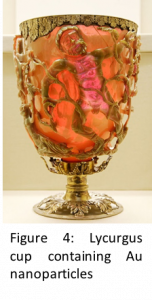 Also, the infamous Lycurgus cup from 4th century Roman era (Fig. 4), now in a British museum, is an artistic example of this effect as the colloidal gold nanoparticles change color with the direction of incident light. In more modern applications, surface plasmon resonance in metallic nanoparticles has enabled easier and efficient bio-sensing and lab-on-a-chip devices. In addition, the semiconductors nanoparticles exhibiting quantum confinement have led to development of light emitting diodes, solid state lasers, quantum dot sensitized solar cells and are paving way for quantum electronics and quantum computing. So far, we have discussed the two size-dependent effects separately and it appears that surface effect mostly influence physical properties and the quantum confinement mostly dictates electronic properties. However, often in nanomaterials it is not so easy to decouple the two and the properties are a superimposition of both effects. One such example is catalytic activity of nanoparticles example Pt clusters for CO oxidation to CO2. It has been found that the catalytic activity depends on both the size which defines the surface available for reaction and the electrochemical potential of the cluster which is given by the position of electronic states. Hence, the resultant efficiency of the catalysis reaction depends on both surface and quantum size effect. In summary, the unique properties of nanomaterials are a consequence of two size dependent effects namely surface effect and quantum size effect. 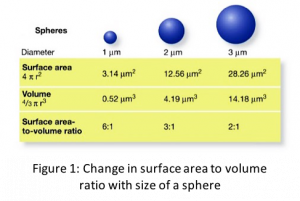 Therefore, properties of nanomaterials show a dependence on size. An inverse continuous dependence on size indicates influence of the surface effect and a discontinuous behavior is a result of quantum size effect. Quite often, it is the interplay of the two effects that control the properties. A lot of research is ongoing to understand and control these two effects to tune the properties of nanomaterials for several specific applications.